LEARN What The Single LIE Is That Holds The Sincere JW To The Watchtower? Jehovah's witnesses beliefs seem to be set in stone. Many of the Jehovah's witnesses are so indoctrinated and their lives are so wrapped up with their religion that they refuse to consider the evidence which any Christian may offer, even if it comes from their own literature! They know they would lose it all if they became a Bible-defined Christian since those who leave the organization are considered apostates and shunned by others, even their own natural family members. Hence, the price seems too great for many, but not all of them. Some Jehovah's witnesses do come to salvation. Christians must try to win them to God, for they desperately need eternal life. Eternal life is ONLY in the Lord Jesus Christ (1 John 5:12,13) and NOT any organization or denomination. Eternal life is also spiritual life, which Christians have now this side of the grave before their physical death. These are true Christian beliefs and important answers Jehovah's Witnesses need to hear. Some Jehovah's Witnesses are answered with a simple Scripture, which they don't know exists. At other times it might take showing them their own false teachings and false prophecies of the Watchtower Society. Never forget, the real culprit is the Watchtower Bible and Tract Society (jw.org) located in Brooklyn, New York (and sometime in the future will move to Warwick, NY). That is their headquarters, who the members think is the one and only Jehovah's Organization where God's truth is found! Thus, all the doctrinal decisions are made there, which will filter throughout the world through their members. That is why the Jehovah's Witnesses want potential converts to read and accept the teachings found in their many Watchtower Society publications. In truth, they don't have Bible studies! They have Watchtower book studies where potential converts are jumped around from partial Scripture to partial Scripture to arrive at their predetermined conclusions. Hence, the Watchtower Bible and Tract Society is a dangerous enemy to God's truth and to SOULS! They are diabolical deceivers and have gone so far as to conveniently produce their own so-called translation of the Bible, which they call The New World Translation. The Jehovah's Witnesses who come to our doors and who are seen on the streets holding up their magazines are victims and slaves of the Watchtower Society. They have bought into the single lie that God's truth can only be found through the Watchtower Bible and Tract Society's materials. 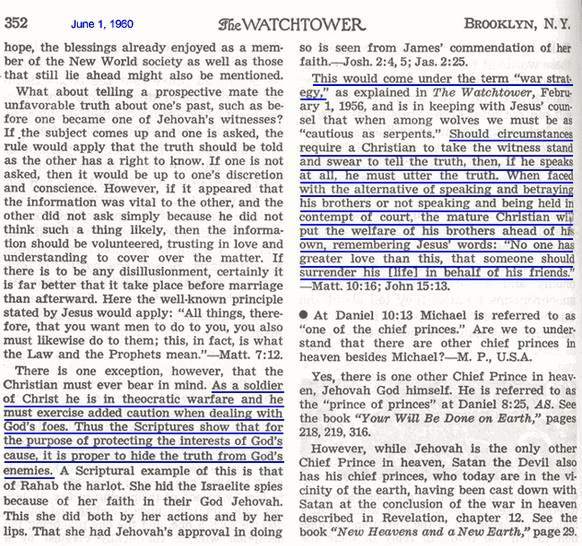 ONLY the governing body of Jehovah's Witnesses can correctly interpret the bible (The Watchtower, 10-1-1967, p. 587). That has sadly led to the Jehovah's Witnesses brainwashing. The gospel is that the kingdom was established in the heavenlies in 1914. Jesus is only a god and Michael the archangel, the first and greatest creation of Jehovah God. Hell is the grave, where the dead rest unconscious awaiting a resurrection. Man is a soul, that is, a man's physical body is the same as his soul. To qualify for baptism one must understand Jehovah's Witness beliefs. Jesus became the Christ after his baptism at the age of 30, NOT at his birth! (See image to the right.) In contrast to the Watchtower, the Bible says JESUS WAS BORN THE CHRIST! Wicked people and the devil will be annihilated. The departed soul of man is unconscious (or asleep) until the resurrection. Only 144000 can be born again and will go to heaven. The rest of the faithful Jehovah's witnesses will live forever on paradise earth. Jesus is the mediator between Jehovah and the 144,000 ONLY and not all mankind. Jesus did NOT resurrect bodily, when he resurrected. The Holy Spirit is referred to as holy spirit and is Jehovah's active force likened unto a radar beam - NOT a person. Some people will be given a second chance to accept God's ways during the 1,000 year reign of Christ. Taking in knowledge, as defined by the Watchtower Bible and Tract Society, is the only way to get everlasting life! Total "despotic" control, by the threat of disfellowshipping, will keep the Jehovah?s Witnesses submissive slaves. It is very sad, but that is the way they (the JWs) have been trained to think and act. NOTE: To believe only the Watchtower Society can correctly teach the Bible, as they teach the gullible Jehovah's Witnesses, is to also cause the individual Jehovah's Witness to thereby disregard all correction from Christians, since the Christians are not spreading Watchtower teachings! It is a win win situation for the dangerous Watchtower Society and a lose lose situation for the individual Jehovah's Witness, who is in dire need of eternal life through the Lord Jesus Christ. If you are a Christian, please know the Jehovah's Witnesses are at your door only to convert you! They have come to teach you, not to be taught. They will try to control what subjects are discussed and will not stop as long as they think they can succeed in changing you to become one of them! Since the Jehovah's Witnesses have five meetings a week in their meeting place, which they call a Kingdom Hall, and practice public speaking and answering people in various situations, they will come confidently and prepared. If you don't know the basic Bible doctrines, some of their own weird beliefs and why they are wrong, you may be much better off not to talk to them at this time. Perhaps after learning how to answer a Jehovah Witness, as cited on this website, you could set up a future meeting. Jehovah's Witnesses need salvation though they have zeal and can quote some Scriptures. Remember, even the devil can quote Scripture (Lk. 4:9,10), so don't be deceived! If you become effective in answering the Jehovah's Witnesses, they may not ever return to your house and will even warn other Jehovah's witnesses to stay away too! The Jehovah's Witness cult needs to be answered and exposed. The need is great. To the Jehovah's witnesses the gospel is that the kingdom was established in the heavenlies in 1914! They don't really have a clue about believing on Jesus for eternal life or the biblical gospel of Jesus Christ. In fact, their understanding of the believe meaning is poles apart from scripture. The Jehovah's Witnesses believe ONLY the Watchtower Society (their headquarters) can correctly interpret the Bible. Why? Because that is how the Watchtower Society taught them! In other words, the Watchtower Society has taught them only the Watchtower Society can correctly understand the Bible, but it wasn't that obvious as it was occurring. Sooner or later everybody is going to encounter a Jehovah's Witness. Our new set of questions for thinking Jehovah's witnesses will help you convince them they really do not have God's truth as they have been deceived into thinking. Click here for a pdf print out of those Questions For Jehovah's Witnesses. 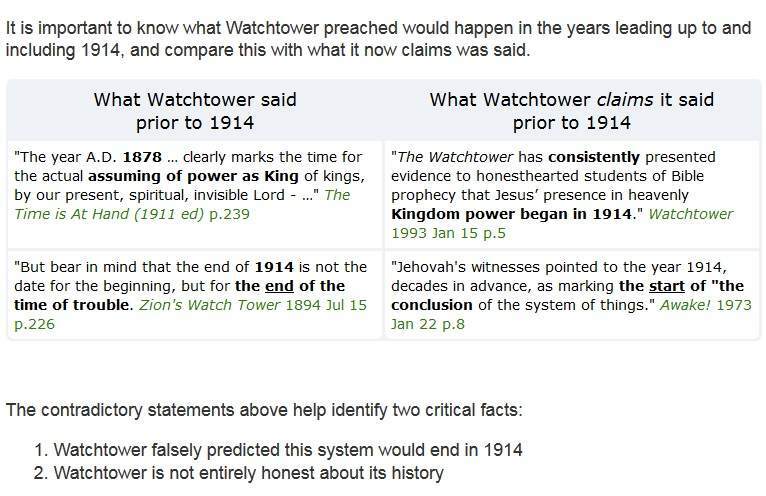 The New World Translation (NWT) of the Jehovah's Witnesses is a very important piece of evidence to examine when considering the self-exalting claims of the Watchtower Society. The Watchtower Bible is NOT a consistent or accurate translation of scripture. In fact, the Jehovah Witness Bible is grossly misleading in various ways! This proof is CLEAR AND DESTRUCTIVE to the Watchtower Bible and Tract Society. La Traduccion Nuevo Mundo de los Testigos de Jehova es una muy importante pieza de evidencia a ser examinada al considerar los auto-exaltados reclamos de la Sociedad Atalaya. The governing body of Jehovah's Witnesses changes their doctrines over and over again. They do that and call it 'New Light.' Find out why that is wrong and how those changes place a spiritual noose around the neck of Jehovah's Witnesses. This poem will take the reader from the way it starts to becoming a JW to a wonderful ending by finding eternal life in JESUS Christ. The early Christians worshiped the Lord Jesus (and prayed to him). Are you in the same truth that the early Christians were in or have you been deceived by a false teacher? Jehovah's Witnesses (or Jehovah Witnesses) are people who think God's Organization on earth today and single channel of spiritual truth is located in Brooklyn, New York. They call that place The Watchtower or sometimes Bethel, from the Biblical term which means house of God. Most significantly, they also believe only their leaders in Brooklyn have the ability to correctly interpret the Bible and accurately teach God's word. 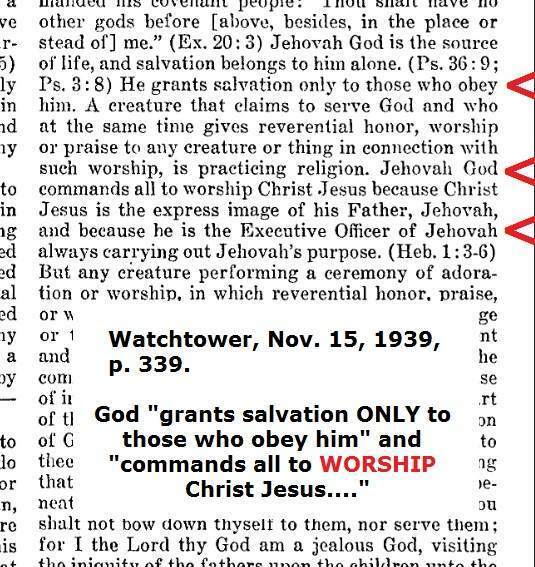 "Worship of Christ Jesus" was necessary for "salvation" in 1939! The opposite of that is how the Jehovah's Witnesses are taught today. Now, though scriptural, worship of Christ Jesus is considered idolatry. That change in MAJOR DOCTRINE means the 144,000 Jehovah's Witnesses were actually idolaters and didn't go to heaven as taught. WHY? Because idolaters go to the lake of fire (Rev. 21:8). Jehovah's Witnesses wrongly believe Jesus is Michael the Archangel. This is an examination of how the Jehovah's Witnesses came to that faulty conclusion and why that Watchtower belief is serious error, based on scripture. The Jehovah's Witnesses have been wrongly taught by the Watchtower Bible and Tract Society in many areas, especially about salvation. Among the various errors they spread about salvation, their denial of an instant and present-tense salvation for the believer in Christ is easily refuted. What confuses this issue is the other tenses in salvation too. The humanity of Christ is important to know about when teaching the deity of Christ because Jesus is both God and man. Hence, he is the God-man. Not knowing about his humanity has misled some into believing the vicious attacks against the deity of Christ, as presented by the Jehovah's Witnesses and other counterfeit Christian groups. They wrongly argue that he is man and therefore can't be God, but that conclusion doesn't follow, as you will see. People are not aware that Jesus is God by nature, but not the person of the Father. The seventh volume of Studies in the Scriptures identifies itself as the posthumous work of Pastor Russell. Are the teachings of Charles T Russell keys to spiritual understanding as claimed? Brother Adrian, one of the ex Jehovah's Witnesses, shares his personal experiences in and out of the Jehovah's witnesses twice as well as his experiences with the "evangelical" churches in our dark day. Here are six basic facts regarding how the Jehovah's Witnesses think about spiritual issues. Read them over and you will better understand their way of thinking. Charles Taze Russell was the founder of what is now known as the Bible Student movement. Joseph Rutherford, who succeed Russell, was the one who actually started using the name Jehovah's Witnesses. Many don't know much about Charles Taze Russell, while the Jehovah's witnesses themselves have been grossly misinformed. Charles T Russell was a definite heretic. What the individual Jehovah's Witnesses are teaching others is NOT original with them. The Jehovah's Witnesses have been taught only the 144,000 will be in heaven and they are all Jehovah's witnesses! Is this really Biblical? The deity of Christ is revealed through indirect evidence (among other ways). The indirect evidence centers around: (1) Jesus receiving worship, (2) Jesus being prayed to, (3) Jesus declaring we are to trust him the same as we are to trust God and (4) Jesus instructing us to honor him the same as we honor the Father. The whole Bible is filled with references to Jesus in one way or another. Each name or title refers to yet another important place or position that Jesus holds in God's plan for man's salvation. Was Jesus mistaken at John 5:37 or could there be another explanation regarding who was heard and seen as God in OT times? The following email was sent in from a former Jehovah's Witness regarding the JW doctrine dealing with the incorrect date of 607BCE for the Destruction of Jerusalem. All through the Scriptures we find evidence that Jesus is not the Father, but is deity (God by nature) like the Father. With all of this evidence about plurality between the Father and Son, how multitudes have been deceived about this is alarming to say the least. It seems once again that a creed or doctrinal confession has been the basis for one's personal belief rather than the Holy Scriptures. The truth is: Jesus is not the person of the Father, but he is deity like the Father. Such are true biblical Christianity beliefs. Every person will encounter a Jehovah's Witness, since their door-to-door and street evangelism is so thorough. They usually make an issue about knowing God's name, even to the point of calling themselves a Jehovah's Witness. The JWs aren't aware that the name "Jehovah" was created by a Catholic monk named Raymundus Martini in the year 1270! This teaching will help the Christian answer them. Toda persona se encontrara alguna vez un Testigo de Jehova, ya que su estilo de evangelismo puerta a puerta y en las calles es tan esmerado. A menudo ellos forman discusiones acerca del conocer el nombre de Dios,hasta el punto de llamarse a si mismos Testigos de Jehova. Este articulo le ayudara al Cristiano a responderles. The Trinity is a very important doctrine to know about because there are a lot of groups that deny the Trinity. The real triune God definition is NOT a belief in three Gods, as the Watchtower Society teaches it is! Jesus is NOT the Father. La Trinidad es una muy importante doctrina, la cual debemos conocer porque hay muchos grupos que niegan la Trinidad. 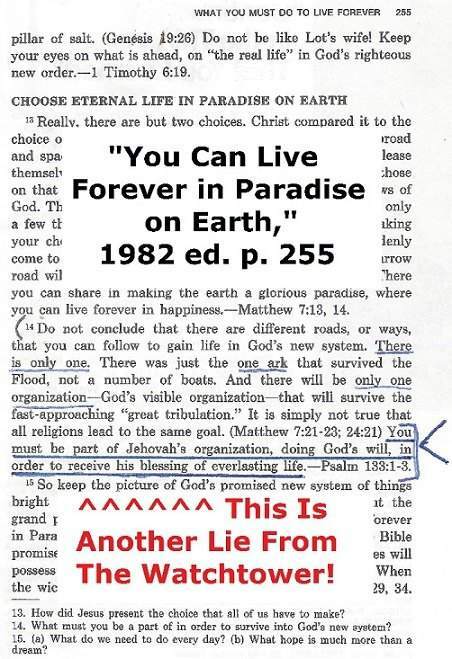 In a six page tract published by the Watchtower Bible and Tract Society, entitled What Do Jehovah's Witnesses Believe? a select few of their teachings are mentioned. The Wicked Dead - Will They Experience Annihilation or Eternal Torment? If Scripture pointedly declares that the wicked dead will be eternally tormented, then we must interpret God's mercy, love, grace and justice as allowing for this. This article is a powerful refutation to the teaching of annihilation. If we test everything as commanded, this evidence leads to such. Si la Escritura especificamente declara que los que mueren en iniquidad van a ser eternamente atormentados, entonces debemos interpretar que la misericordia, el amor, la gracia y la justicia de Dios permiten que sea asi. Este articulo es una poderosa refutacion a la doctrina de la aniquilacion. Many deny the deity of the Lord Jesus Christ. They all tend to use the same argumentation, which is dealt with in this article. Muchos niegan la deidad del Senor Jesucristo. Todos estos tienden a utilizar el mismo argumento, al cual nos referimos en este articulo. If you are in tune with God's Spirit, his truth and are teaching the real gospel like the early Christians, you will be pointing people to Jesus for salvation, not an organization. If not, then you have been grossly deceived and are lethally deceiving others with a false gospel. The Watchtower Society | Print this as a tract in pdf format (change your printer settings to legal/landscape). "Jehovah's Organization" or false prophet (ravening wolf in sheep's clothing, Matt. 7:15)? How shall we know? "La Organizacion de Jehova" o Falso Profeta (Lobos rapaces vestidos de ovejas, Matt. 7:15)? Como podemos saber? Is He "better than the angels" (Heb. 1:4)? Es EL "mayor que los angeles" (Heb. 1:4)?